I love this recycled felted sweaters baby quilt pattern because it is so many things in one and is a perfect baby gift. Luxurious (imagine making it entirely out of cashmere sweaters! ), meaningful (handmade, plus you could even make it out of sweaters donated by everyone in the family), ecological (recycling! Need I say more? ), unique, and even inexpensive. 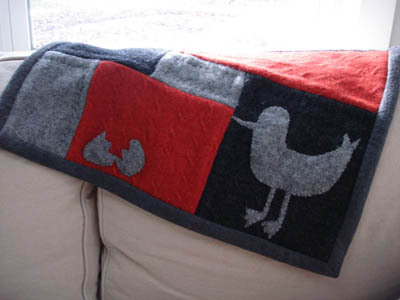 You will need about 3-4 sweaters for this small baby quilt pattern (34" by 26"). You can pull sweaters from your own closets, or get donations from family members. I buy sweaters from thrift stores to make the quilts that I sell through Papou (although I've also started compulsively eyeing sweaters on everyone around me, imagining how it would look in a baby quilt. Watch out unsuspecting sweater wearers!). New to felting? Got to the How to Felt Sweaters page which includes step by step instructions. The sweaters must be 100% wool (this includes cashmere, alpaca, merino, lambswool, etc). You can sometimes get away with using a sweater that is 95% wool and 5% acrylic, but it will felt best if it's real wool through and through. If the wool content isn't given on the label, "handwash or dryclean only" is a good sign that it's wool. The sweaters should be similar weight - in other words, if you choose a lightweight sweater with tiny little stitches, they all should be lightweight with tiny stitches. If you choose a sweater that is bulky and heavy, the other sweaters should be similarly bulky. This gives you a more even quilt surface, and makes it easier to sew. It's best to avoid ribbed sweaters (sweaters which are entirely knit in a ribbed vertical pattern, similar to traditional hems and cuffs). These sweaters are very elastic, making it difficult to get an even quilt surface because they'll pull at all the edges. They can also warp when felted, make it challenging to sew. Basically all of the above hints for choosing sweaters are to help you end up with the smoothest quilt surface and least frustrating sewing experience possible! This is perhaps obvious (and really just a personal choice), but I try to find sweaters in an array of colors that make a nice color "family". For example, all earth tones with a few splashes of bright color, or all soft pastels, or all jewel tones. If you have inside knowledge about the parents' plans for the new nursery, you could even choose colors in that palette. 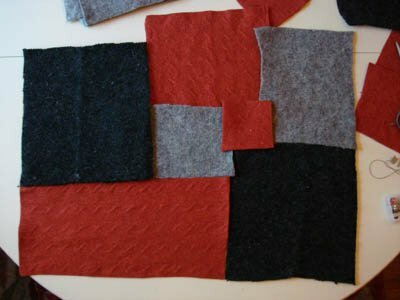 Create the baby quilt pattern patchwork surface by cutting your felted sweaters into squares with a 1.5" seam allowance. Technically, you could make more fancy shapes, but I only recommend that to REALLY experienced sewers/quilters, otherwise you'll just end up cursing the sewing machine and all the little wonky pieces. I like creating squares of varying sizes, but you can also cut equal-sized pieces for a traditional patchwork quilt. If you're a new sewer this might be the way to go because it's the easiest to sew together neatly. Lay the squares on a table surface in some combination to form a rectangle. Play around with the pieces until you find a balance of colors and shapes that you like. Beginning at one corner of the baby quilt pattern, pin together your squares end to end to make a long strip. Leave a 1.5" seam allowance. Depending on the size of your squares, you may end up with 3 or 4 long strips (or many more, if you decide to make small squares). Once each strip is sewn, steam iron the seams open and flat. Then sew the long strips to each other, one after the other, to form the rectangular quilt surface. Steam iron all the seams so that they are open and flat. You'll probably have really bulky areas where multiple seams meet. Cut a v-shape into those seam corners so that the seams lie flat more easily. Turn the quilt right-side-up and steam iron it completely so that you have a nice, even, flat quilt surface. Iron the fleece. Lay the fleece fabric flat on a smooth surface, like a table or wood floor. Very carefully, lay your quilt surface face up on top of the fleece, smoothing as you put it down so that the fleece underneath stays completely flat. This is really important because it helps you to end up with a smooth back (unpuckered) quilt back. Cut the fleece so that it's two inches longer on each side than the quilt surface. 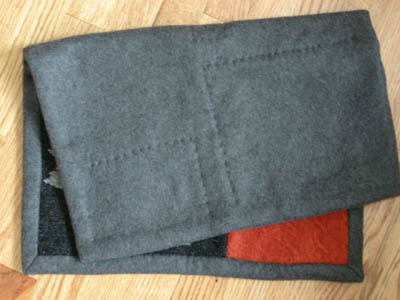 Fold the fleece edge over twice to create a rolled hem flush with the quilt surface, pinning as you go. When you get to the corners, you have two options: a simple square corner, or a more professional (and challenging) mitered corner. For a square corner (above) cut off excess fabric on one side of corner, roll other side of corner and pin in place. For a mitered corner (above) cut off excess fabric on one side of corner, cut a triangle the width of the rolled hem on the other side. Fold hem up so that it touches edge of quilt face. Fold over triangle then fold hem second time and pin in place. 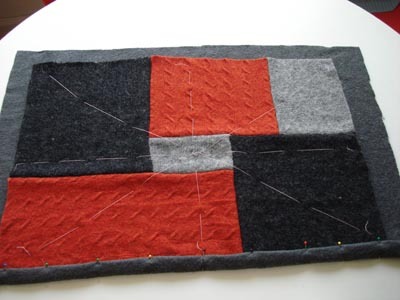 Finally, sew the fleece rolled border to the quilt with an invisible stitch or blanket stitch. You're almost done! A this point you can finish the quilt in several ways. 1.) Tack the quilt surface and fleece backing together at several points in the quilt, for example at the corner of each square. 2.) Or, quilt the surface in the traditional way by sewing along the edge of each seam with a running stitch (tracing the squares). 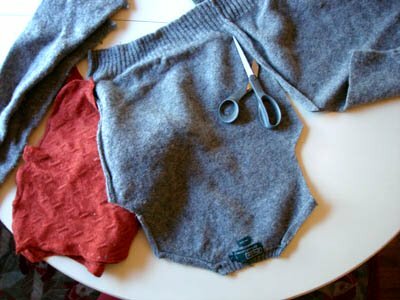 This is difficult to do because of the thickness of the sweaters, so you should sew about an inch away from any seam, and sew with big stitches (about half a centimeter). Finally, cut off the basting stitches and pull out the thread. You're done! Yay!! Go to the Make Your Own Baby Bedding & Blankets Section for more project ideas! 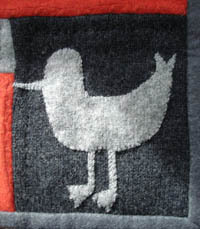 Back to the top of the Felted Sweaters Baby Quilt Pattern page. This tutorial was written for us by Shira Adriance who makes lovely, handmade felted baby quilts as well as knit and sewn baby apparel at Papou. Please visit her shop, support our contributors and buy handmade!